Preparation and Storage Centers, or TPN, total parenteral nutrition compounding units are high quality stainless steel combination cabinets and working units. CMP Preparation and Storage Units have been designed for the storage and functional requirements of the hospital, pharmacy and emergency room environment for medical storage and preparation. CMP Preparation and Storage Centers have evolved into the industry standard for this application. CMP has been building high quality stainless steel Preparation and Storage Centers for over 67 years and they can be found in hospitals worldwide. Preparation & Storage Centers with Laminar Flow Hoods or TPN Compounding Units can be configured for your unique requirements. CMP Preparation and Storage Centers are completely inter-piped and inter-wired, requiring only one single connection for each service. Required service connections are ½“ I.P.S. for hot and cold water supplies; 1½“ I.P.S. for waste. The unit can be wired for: 115 VAC, single-phase, 60 Hz, 10 or 20 amperes being required (single connection in circuit breaker panel). CMP Preparation and Storage Centers are constructed of type 304 stainless steel. Welding is done by the Heliarc process. All exposed welding is ground and polished to match the No. 4 finish. CMP Preparation and Storage Centers have countertop working surfaces of 660 sq. in (4,259 sq. cm) and integral 16” x 14” x 7” deep one-piece, die-stamped cove cornered sink complete with waste strainger welded in top. The sink has radius corners and is integrally welded into the countertop. The sink has a combination hot and cold wrist controlled chromed swing-spout deck-mounted faucet. Also a top-refillable soap dispenser, chromed towel dispenser, recessed diffused flourescent lights with combination light switch and grounded outlet is provided. CMP Preparation and Storage Centers have a 9 sq. ft. (0.84 sq. 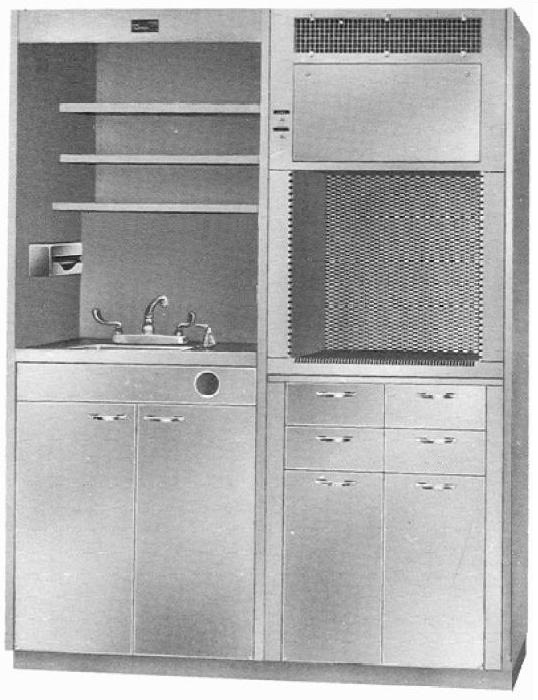 m) storage area above the sink and counter with stainless steel shelves. Two 30” x 14” adjustable shelves and one 30” x 16” fixed shelf complement the sink and storage area. A Closed compartment below the sink and counter provide 8 more sq. ft. (0.74 sq2. m.) of shelf area. CMP Preparation and Storage Centers include a Laminar-Flow Cabinet and module with storage drawers and compartment. Four stainless steel, coved-corner, removable pan drawers are mounted on full-extension nylon bearing slides for smooth operation. Two drawers are equipped with tumbler locks. Four stainless steel coved-corner slide out trays are positioned below the drawers for storage of I.V. administration and prep kits, venipuncture sets and arm boards. The trays are accessed through the compartment doors. The I.V. Storage Cabinet consists of six stainless steel dispenser shelves which glide out for loading bottled I.V. solutions from either side. The shelves accept all standard size I.V. bottles or plastic containers which are dispensed from the front and are capable of being positioned at the left or the right of the Laminar-Flow Cabinet (see Options). CMP Preparation and Storage Centers have a storage compartment above the counter top. The compartment has an interchangeable step or tray shelves for medicine storage. Adjacent closed section contains three adjustable shelves for storing nourishments and solutions. CMP Preparation and Storage Centers have recessed fluorescent lights mounted in the vented canopy over the work area, out of the operator’s line of sight. The fluorescent lights provide a minimum of 200 ft.-candle illumination for detecting of incompatibilities, hairline cracks in bottles and particulate matter. CMP Preparation and Storage Centers have a Blower System that includes a five-position switch voltage control for blower speed regulation. CMP Preparation and Storage Centers come equipped with a Pre-Filter and Final Filter for Air Flow.